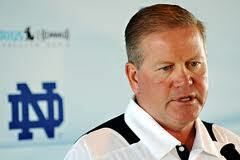 Brian Kelly is throwing a big surprise for the first televised Blue-Gold game at Notre Dame on Saturday. The two main quarterbacks Dayne Crist and Tommy Rees will be nowhere to be seen in the biggest game before the opener in September. Instead sophomore Andrew Hendrick and Everett Golson, the rookie, will line-up behind center. All eyes will be on Hendrix who can run as well as pass, something Crist and Rees do not do well . Golsen is regarded as a future starter who fits a Kelly-type spread offense to a T.